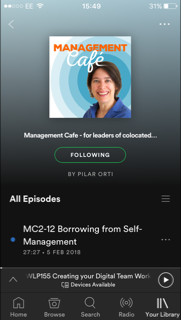 00:30 Pilar introduces the podcast, talking a bit about her own experience dubbing e-learning and corporate videos. She has a few tips for you if you're creating products/training to reach your global employees. (See script below.) If you're interested in the world of voiceovers, you should listen to Episode 16 Mike Russell and Music Media Creative and if you're interested in expanding your business globally, listen to The Bottom Line episode on Global Business. 12.50 David welcomes Pilar into the studio and we go on a short tour, including meeting Adrian, one of the engineers. 15:50 David tells us his story, how and why he set up Golocalise. 23:10 Does a good demo always mean the voiceover talent is good? 26:00 What is localisation and how is it different to translation? 29:50 The different clients and products that Golocalise works with and how their services have developed. 32:35 Corporate learning and localisation. Some tips towards succesful localisation. 41:30 The benefits of bringing the voiceovers into the studio. 43:45 What's next for Golocalise? David shares some of the ways in which he's marketing his business: content marketing and building your marketing funnel. Need any advice? Contact David. Today’s episode is dedicated to the world of language localization, that is adapting a product, in the case of our guest, usually a media product, like an online training course, a training video, a corporate video or even an advert or a videogame. But the episode goes beyond that of course, as many other aspects of work cropped up in the conversation with David Garcia Gonzalez who is the CEO and owner of Golocalise, a company based in London specializing in translations and voiceovers. Golocalise also has its own studios, so I went down there, to inverview David in situ, as I try to do that when I can. I have a lot of fun when I talk to people online, but there really is nothing like sitting down chatting next to someone. This is something I’m constantly thinking about – is human interaction replaceable? And I think that there is nothing like sitting down with someone for a chat. Video comes close, audio, sometimes for me, comes closer because I don’t feel like I need to be looking at the screen all the time, in the same way as when you’re next to someone, you have a bit more flexibility of movement. The other reason why I like picking up the portable microphone and going somewhere else is to give you a little bit of a different feel, as the background noise is different wherever I go. Sometimes it’s been too much and I’ve had to archive the conversations, which makes me a bit sad, but I think there is only so long that you can listen to café noise when you’re not in the café itself, but mostly, I think that the odd siren or door, or even background chat adds something to the atmosphere of the conversation. In this episode, however, there is not much of that because the studios are insulated, of course, so I did very little editing and processing on this one. I find the whole conversation about localization really interesting, because while we’re all assuming that we can go global with our products and services, I think the public, me included, is getting tired of this and demands something more localized, and often even more personalised for them. I’ll try not to stray so much from the subject but I wanted to bring in a personal thought, that that is also why, for example, we’re getting such strong nationalist movements in Europe now, for example. The more exposure we have to the whole world, the more our own identity can get lost and therefore, the more we look for something to hold on to, so that we don’t blend into the rest of the world. And localisation shows that, indeed, markets want something that is not just in their own language, but that is adapted to them, as David will explain. I don’t know if you know, but as well as working on online training and virtual teams, I work as a voiceover, in London, going into the studios, voicing mainly products for the Spanish market, in Spanish. I think there are many factors to consider when you are adapting training materials for a global audience. In particular, I’m thinking of the many videos I’ve dubbed, where I had to speak very fast in order to fit in the Spanish over the English. The most savvy clients, know that some languages, like Spanish, tend to take up more space, and so factor this in when they are creating the presentation – they make sure that there is some space in the video and that the voice is not covering every single second. This means that if you have spoken text that needs to go over specific points in the video, like a bullet point list, you can move the sound around and make it match. The number of this kind of jobs I do keeps increasing, but most clients still create the original product without thinking of how it’s going to be used in the different languages. I don’t usually give much specific advice myself in this podcast, I usually leave that to Lisette, my fortnightly co-host, who is great at giving actionable advice, I’m more of a , here’s my opinion, I hope it provokes you to look at things differently. But I’ll make an exception here. There is something else that needs to be looked at when you have a global company and you are creating training materials or, delivering training programmes worldwide. How much of the text do you need to and can you, translate? For example, if you’re creating a new training programme for an online platform, will the commands be in English? If so, would it help to translate what they mean, in order to give the user a better experience? Or, is it normal in the company to refer to certain technical terms by their English name? And if you’re delivering face-to-face training, have you translated all the materials, including that one minute video you found on the internet which illustrates your point so well? Last year I was being trained by a multinational to deliver some of their internal training to Spain and, as part of the training materials, they wanted to introduce Simon Sinek’s TED talk, Why Good Leaders Make You Feel Safe where he talks really fast. After we watched it, the only thing on my mind was, Is there a dubbed or subtitled version of this? Not something the client had thought of. Another example, the training session which was not optional and was being delivered throughout the organisation, started with a message from the CEO. Again, in English. Had this been subtitled? At a point in time when the word Engagement is being used constantly, not thinking of what signals you’re sending to employees across the globe through the materials you provide for them for internal training, seems to me completely mad. Some of these changes need not be expensive, but somebody has to care enough to think of them and approve them. Regardless of this, personally I love voicing these corporate videos and training materials because they usually reflect what’s going in the world of learning and development too, and it’s happened more than once that I was reading in the morning articles on a subject and then I’ve gone over to do a voiceover where the company was addressing that specific aspect of employee development or training. Sometimes I feel like I’m spying. But back to today’s episode. So, David has built a studio and a business which reaches a global audience through a specific location in London. And if you’re interested in the world of speech, voiceovers etc, then check out episode 16, where I speak to Mike Russell, who is the Creative Director of Music Media Creative, also working with voiceovers, but this time they’re scattered all over the place, and their products are quite different. In today’s episode with David, he tells us how he set up his business, we go into some depth about the world of voiceover and then we move onto the global aspect of communication through these kind of products, corporate videos and elearning and the problems with localization. I do hope you enjoy the episode, thank you so much for listening, the number of good, high quality podcasts is increasing and, just remember, that if you’re interested in the global aspect of business, just this morning I listened to an episode from the Bottom Line, from the BBC, called Going Global, on exactly that, exporting, and the episode was aired on 12 March 2015. Really interesting, check it out. All right, for now, let’s join David Garcia at Golocalise. Newer PostWLP25 Remote Working: Blessing or Curse?